As a mother of 2 boys already, I have had many years of shopping for boring jeans, tops, socks and all the rest of it! Our third child decided to give us some fun as a girl and I must say I have loved the break I've had with the pink and frilly stuff instead!! HOWEVER! This baby, due in just a few weeks, is going to be ANOTHER boy and so here we go again, back to the boring old boys clothes...or is it!? Clearly I seem to find it hard to get into the boy thing seeing as I've "been there, done that", but FEAR NOT mama's of boys, I have found something SO adorable that you just can't help but swoon - and (the best part is) this little outfit is made from soft and huggable, sustainable BAMBOO! Yes! You heard me correctly, and if you have seen any of my previous posts relating to bamboo, you will know just how excited I am every time I talk about this resource! You can make a lot from bamboo and there are many benefits to gain from it! While it is a fairly new process, which can only get better, it is going in the right direction and I just can't get enough! To fuel my current obsession with bamboo clothing, I received in the mail this week a gift set from Bamboosa, which is a fabulous company that I would love to bring to your attention! Using bamboo from china, which is imported to the states, Bamboosa is a "Made in America" company, which keeps Americans on the pay roll and produces quality, organic and better-for-the-environment clothes and accessories, which are just cute, soft, adorable and perfect for all! 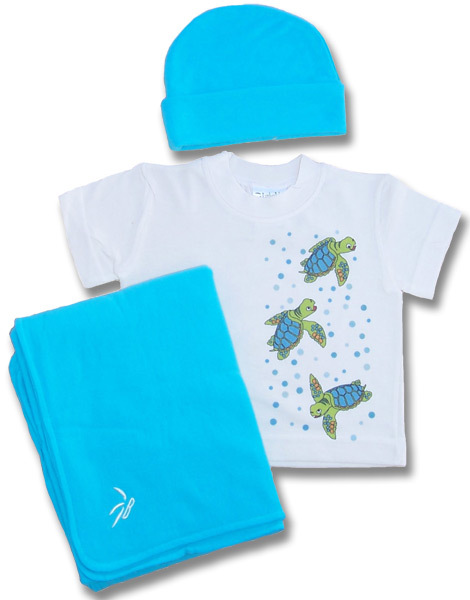 Comprising of a top, bottoms, hat and blanket in the most delightful turquoise-blue color (my favorite!) with adorable little turtles patterned on the front of the top and the leg of the pant! The hat is block color and the blanket matches oh-so-delightfully and I can NOT wait to be able to put this on our new bundle of joy! The outfit is soft to the touch, and the quality is evident and the price is perfect at just $40 for the entire set, available in Infant or Toddler sizes, which you can find HERE if you would like to know more! Now, here is where it gets really exciting! As if I'm not already gushing enough! 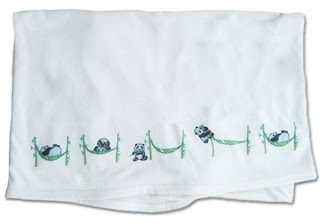 Bamboosa have a brand new Swaddle Blanket and they would LOVE for one of you to WIN IT! 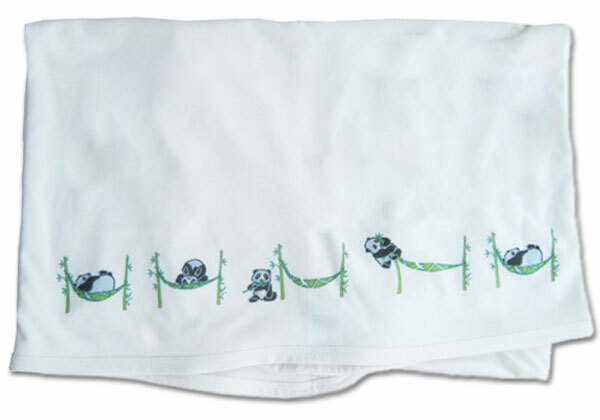 Available in 5 different shades, the 42x42 blanket, made from 70% Viscose from Organic Bamboo and 30% Organic Cotton, features sweet little panda bears made to melt your heart! Valued at $26.00, this blanket would make a wonderful gift for any baby and you are going to LOVE it! To view the blanket, color alternatives and availability, you can head on over HERE to find out more! To be in with a chance of WINNING a Baby Swaddle Blanket of your very own, all you have to do is to enter via the Rafflecopter form BELOW! You can enter as many options as you like, or as few and nothing is mandatory! However! The more you do, the more chance you have of winning, and we all know how much we LOVE to win!! SO! What are you waiting for! Head on down and enter the giveaway, which is live NOW and ends on Sept 10th, 2013 with ONE WINNER! Entrants must be in the U.S and over 18 years of age, or have parents permission to enter! The winner will be contacted within 24 hours of giveaway end and MUST respond to the winning email within 48 hours to claim their prize so PLEASE enter with a valid email address! If no response has been received within 48 hours then a new winner will be chosen until we have a confirmed response! Mom's Gone Bronson is NOT responsible for the fulfillment of this prize, which is being provided by, and with thanks to, Bamboosa! Disclaimer: I received the turtles outfit for the integrity of this review and was not otherwise compensated or influenced for my opinions, which are honest and my own. Your opinions may vary. Thank you! My son due in December! I have a niece do in November, this would be great for her! My fiance's best friends baby! for one of my new grandbabies! i have one thats 5 mnths one that 3 mnths and just found out tonight that there is another one on the way! then i have my 10 yr old granddaughter but she just to big lol! My friend will LOVE this!